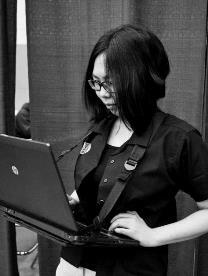 Six Spoilers from Rise of the Eldrazi (ROE) come out today! These spoilers are intended to introduce some new mechanics and give a little peek into what ROE will be all about. Here's the first of six, Corpsehatch. This card is pretty good. Reminiscent of Gloomlance from Shadowmoor which was a very strong Limited spell. However this is an uncommon, so there's probably something more to it. For one thing, it gives you creatures. And these creatures store mana in an intriguing way. The intended use, one would imagine, is to power out those crazy Eldrazi creatures that cost 10+ colorless mana. 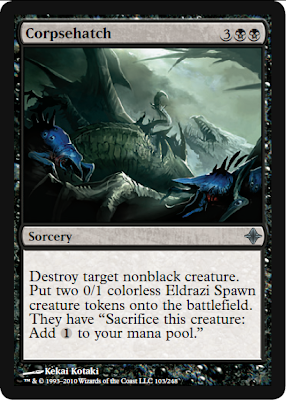 Definitely expect more of this type of spell in Rise of the Eldrazi - I suspect there will be lots of mana-production, lots of token generation, and lots of sacrificing of permanents going on in this new set. One way or the other. This is one reason I suspect the ability "Annihilator" may not be as devastating as it seems - surely generating permanents has to be about as easy as destroying them in ROE to make games not totally one-sided and swingy. There are lots of other uses for a card like this since there's a lot of advantages to using it, even if you don't want to pump out an Eldrazi. Tokens, mana generation, graveyard interaction, creature destruction - this card has got it all. I predict it will be a Limited powerhouse. Mammoth Umbra, second card in the lineup. I'm really excited about Totem armor. Well, not REALLY excited, but it's a pretty decent mechanic. And I like it just by looking at it. It's a little sad when facing bounce spells, sac spells, or exile spells. But it's still doing a lot by saving your creature the first time it would be destroyed. 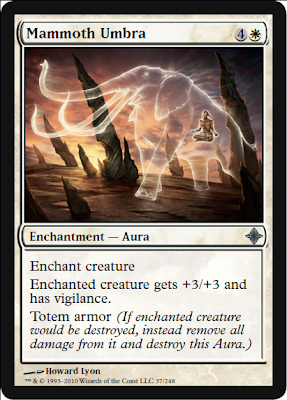 Now if your opponent wants to deal with your big 5/5, probably the best he or she can do is to get rid of the aura first. Which is considerably less profitable than 2-for-1-ing you some way. 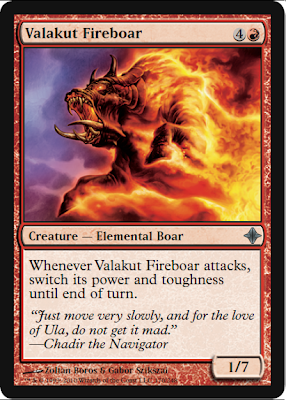 This card in particular, well, its usability will depend on how fast/slow of a format RRR draft is. (Or is it EEE?) I suspect the format will be a lot slower than ZZZ or ZZW, but this is because these formats were supposedly a lot faster than people were used to. It may be slower, also, just because the "focus" of ROE seems to revolve around ten-mana spells. But I could be totally wrong about that. 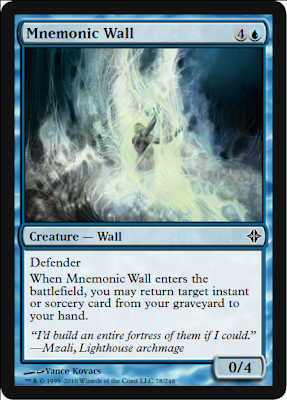 Mnemonic Wall, three out of six, is going to get misspelled all over the place. It's similar to creatures like Nucklavee. It seems like recurring something like Corpsehatch can be really sick in Limited. But this spell's value will definitely fluctuate with the quality of instants and sorceries you have. I don't think it has much Constructed potential. If it does, it probably only goes in decks I wouldn't play anyway. In general, a 0/4 defender is really unexciting, though. This Eldrazi has Annihilator 3 and can't be blocked except by three creatures. So, it asks the question, "Do you want to sacrifice your tokens or your land? Do you want to block or take 9?" This creature seems like a game ender if it ever swings, but maybe it isn't. Maybe it is. I am still not sure. But for this whole Eldrazi thing to make sense to me, I have to assume there are ways to have three+ creatures on the board and still some to spare to the Annihilator ability. At least sometimes. The other thing about having a set with a bunch of huge monsters is that the creature removal spells can be a lot heavier in mana cost (say, 5+ cmc) and still cost much less than the Eldrazi creatures themselves. Perhaps we'll see an abundance of such expensive removal in ROE? Prey's Vengeance, five out of six. Free spells. Who doesn't like free spells? Free to cast, doesn't cost a card! Rebound is one of those mechanics geared toward the Spike in all of us. 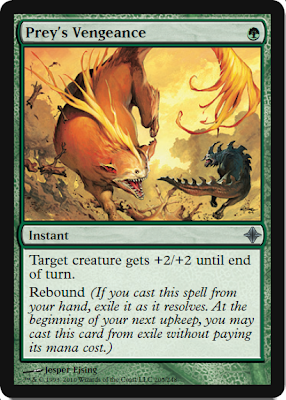 I'm excited to see if there are any wicked rare or even Mythic Rebound spells. I kind of doubt there would be a Mythic Rebound spell. But we shall see what they do with Rebound. If they want to keep it safe, which I figure they will, Rebound will probably be limited to cards that don't automatically provide card advantage. Its flavor is definitely red, and its ability is definitely red. And it's an uncommon. What could this mean? It seems slightly underpowered for a red uncommon. There are a number of reasons why it might be on par with the rest of the set. Maybe, as I thought, there is a lack of efficient removal spells in ROE. Maybe the fact that it is a 1/7 on defense also means something - how good is blocking in ROE? Well, I can't really figure out that much from a random red uncommon. But it is pretty curious that they choose to show us THIS card in particular, which on the outside doesn't seem that interesting. Are people excited by this card? Should they be? We'll see!